Should you convert an old barn or build a new barn style home? Soaring ceilings, open, flowing space, and rustic charm; the traits of a barn are also those desired by contemporary house hunters. Once forgotten, centuries-old barns are now prized by homeowners for their simplistic ascetic, craftsmanship, and connection to yesteryear. Some barn home seekers opt to convert antique barns into their new homes. Others build new homes with barn style architecture. Each pathway to a custom barn home has unique opportunities and obstacles. Today, we will be discussing the factors of customization, ease of building, and energy efficiency. A historic pole barn or post and beam stable that has been on your family’s property for decades could be the ideal way to build your charming new farmhouse. How hard could it be to restore a barn and turn it into a home? On television, charismatic contractors transform leaning barns into luxury homes in just 60 minutes. However, turning a hallowed barn into a home is more complicated than simply hanging drywall and forming rooms. Barns face harsh weather and often fall into disrepair. Over the years, this can lead to the deterioration of the structure. A barn that is usable for farm work may need additional structural support to meet home building codes. Even if you have the barn’s structure assessed by an engineering professional, there may be unexpected discoveries during construction. Necessary structural fixes may limit your ability to customize your new home. While almost any room configuration is possible at first, you may have to address structural issues. For example, if you need to add a timber post in the middle of your stairs or great room, it is imperative that you rearrange the home’s layout for functionality. Furthermore, barns do not to control the temperature and atmosphere like modern homes. In addition to structural work, installing new windows and insulation is necessary in order for a weather-tight home. Depending on the structure, you may not be able to make it as energy efficient as a new home. Despite the possibility of major construction challenges and design changes, converting old barns into homes is very appealing to some. The nostalgia of an antique barn or preserving a precious piece of family history is worth the hard work and unknowns. Overall, building a new barn home gives you more control over the process and outcome of your project. If you start your home design from scratch, you can customize your home any way you want. You can control the size, style, and layout. This is a great advantage if you desire a gambrel barn home in a location where bank barns are prominent. Want an elevator or lookout tower in your home? Custom elements are easier to build from scratch than adapt to an existing structure. Although a new home may not have the history of a Dutch barn, it can still have character and uniqueness. The craftsmanship and tradition of timber framing brings an authentic and timeless element to new barn homes. New barn homes are also more energy efficient than converted barns that have had an energy retrofit. Air leakage and conductive heat loss are two ways to measure energy loss. Today, new homes seal your interior from the elements and minimize energy loss. Riverbend Timber Framing’s barn homes incorporate a building system that works together to create a highly energy-efficient structure. Riverbend’s homes begin with Advantage® brand ICFs (insulated concrete forms), which form channels for and insulate the concrete foundation. Around the timber frame barn structure, Riverbend uses Insulspan® structural insulated panels (SIPs) to form the walls and roof. The panels have a solid core of EPS (expanded polystyrene) insulation sandwiched between two boards of OSB (oriented strand board). SIPs offer structural stability and insulation in one product reducing air leaks and heat transfer at the same time. This helps you heat and cool your barn home with a minimal energy cost. Homeowners who want more design control during their project opt to build a new barn style home. While new construction is not without challenges and unexpected issues, they can be mitigated with a new home design. When considering what home building pathway to take, there are many more factors to contemplate before you make your decision. Continue your research, access your budget, and interview barn homeowners to get the additional information you need. 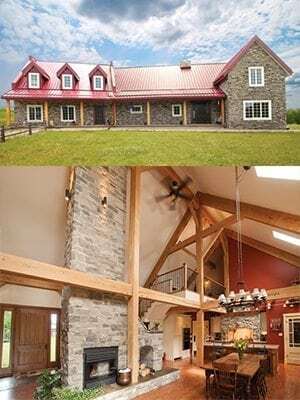 If you would like more information about designing or building a timber frame barn home, a Riverbend Client Representative is happy to answer your questions or discuss your project. Contact us today.